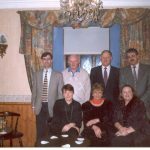 Claregalway Amenity Group held their AGM on the 23rd March 1999 in Claregalway Leisure Centre. Like the Leisure Centre AGM the turnout was very disappointing. Our Group represents Claregalway and without back-up and support, how do we survive? We have provided an essential service to Claregalway with bottle banks etc and we are amazed at how people use them. At this point in time, the banks are overflowing and we, as a group, are extremely disappointed. Dunleavy’s kindly supplied us with their site to facilitate these banks and we feel responsible but also disheartened at lack of support from at lack of support from you, the public. Do we continue to exist, or do we abandon our purpose?